This Acceptable Use Policy sets forth the principles, rules, and regulations that govern the use by you (the “Customer”) of AlphaDog Hosting’s networks, systems, services, and products. This Acceptable Use Policy has been established to promote the integrity, security, reliability, and privacy of AlphaDog Hosting’s networks, systems, and Customer data contained within. When using AlphaDog Hosting’s networks, systems, products, and services the Customer is prohibited from engaging in certain activities that include, but are not limited to, those described below. Such prohibited activities may, at the sole discretion of AlphaDog Hosting, be grounds for termination of a Customer’s Ordered Services, for the application of additional service charges or for the involvement of law enforcement agencies. 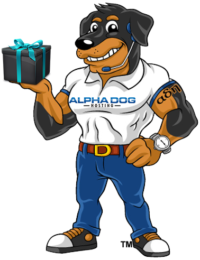 AlphaDog Hosting reserves the right to remove any content or restrict the use of its Services for activities or content that in AlphaDog Hosting’s reasonable judgment, violate the terms or conditions under which AlphaDog Hosting provides the Services or violate this Acceptable Use Policy. Indirect or attempted violations of this Acceptable Use Policy, and actual or attempted violations by a third party on behalf of a AlphaDog Hosting Customer or a Customer’s end user, shall be considered violations of this Acceptable Use Policy by such Customer. AlphaDog Hosting reserves the right at any time to modify this Acceptable Use Policy. Modifications, including additional restrictions will be effective immediately and incorporated into this Acceptable Use Policy. Your continued use of any AlphaDog Hosting service will be deemed acceptance thereof. This section of the Acceptable Use Policy identifies the uses and actions that AlphaDog Hosting considers in its reasonable judgment to be unacceptable and/or abusive, and thus, is strictly prohibited. The Customer may only use AlphaDog Hosting’s networks, systems, services and products in a manner that, in AlphaDog Hosting’s sole judgment, is consistent with the purposes of such networks, systems, services and products. The following examples of prohibited uses and actions are non-exclusive and are provided for general guidance only. 24. to resell AlphaDog Hosting’s services, in whole or in part, to any entity or individual, without AlphaDog Hosting’s prior written consent, or to misrepresent your relationship with AlphaDog Hosting.